The manufacturer started production of the 1.6-liter engine of the M40 series (the full name M40B16) in 1988. In the design of this small engine was laid the M40B18 engine, which has 1.8-liter displacement and longer stroke. 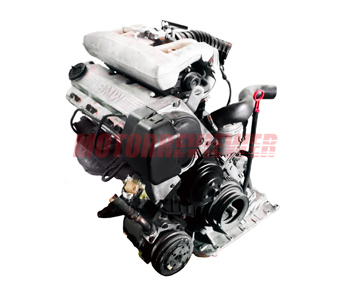 This engine has the cast iron cylinder block, durable and reliable. As mention before the 1.6l M40 engine has its crankshaft with smaller stroke, compare to M40B18, but it shares the same connecting rods (the length is 140 mm). To keep compression ratio on required level, there are new pistons with another shape. The 1.6L engine differs from 1.8L also by intake manifold, throttle body, spark plugs and ECU. The cylinder head is aluminum. It is SOHC 8-valve head with hydraulic tappets/lifters inside. The diameter of intake valves is 42 mm, exhaust valves diameter is 36 mm. M40 camshaft specs: duration 244/244 deg (single pattern cam), valve lift is 10.6/10.6 mm. Timing belt drives the camshaft. It is not as reliable as possible could. The belt has short longevity due to insufficient width. It is better to replace the timing belt every 25,000 miles. In opposite side, there is a significant risk to get bent valves. The engine was used for BMW 16i models application until 1994 then it was replaced by the M43B16 appeared in 1993. All M40 series engines are quite good. Lifespan is about 180-200 thousand mileage. But of course, the M40B16 has some problems like unreliable timing belt, etc. The main issue of this engine is its age. Most of them need to rebuild or to replace some old parts, and all BMW parts are expensive. M40B16 from 1988 to 1991. This engine is a base modification without catalyst. The power is 102 hp at 5,500 rpm, the torque is 105 ft lb (143 Nm) at 4,250 rpm. In 1991 was appeared a new version of M40B16 with catalyst. It has a little bit less power and torque - 100 hp at 5,500 rpm, 104 ft lb (141 Nm) at 4,250 rpm.